Although I have amassed hundreds of patterns over the years, I still find myself going through the boxes of flies again and again picking a few here and there. Back at home I take out the new patterns and start to reshuffle my fly boxes of dry flies, wet flies, nymphs, emergers, streamers, terrestrials, etc., a never ending process, a fun process however, at least for me. 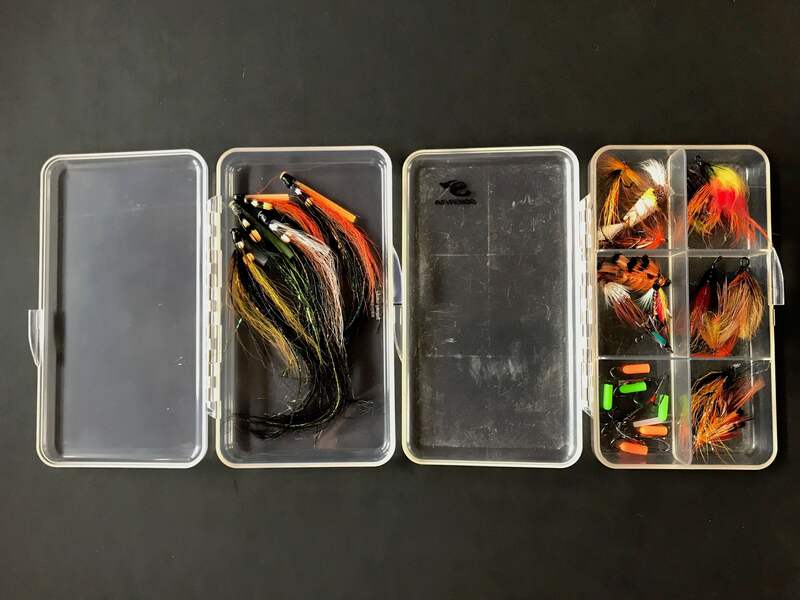 The next question that always arises is which fly box to choose for which situation. My general preference is to reduce my gear and go out to the water with the least amount of things in my pockets. Sure, there are situations when you need a certain range of different types of flies. Still, I then try to choose a few from each category (dries, wet flies, emergers, terrestrials, etc.) and put them all in one or two boxes. I simply don’t like cramped pockets of my jacket, vest or waders. It feels bulky and hinders my casting. Of course the size of the fly box increases with the size of the flies. A streamer for pike or hucho fishing definitely takes more space than tiny dry flies. 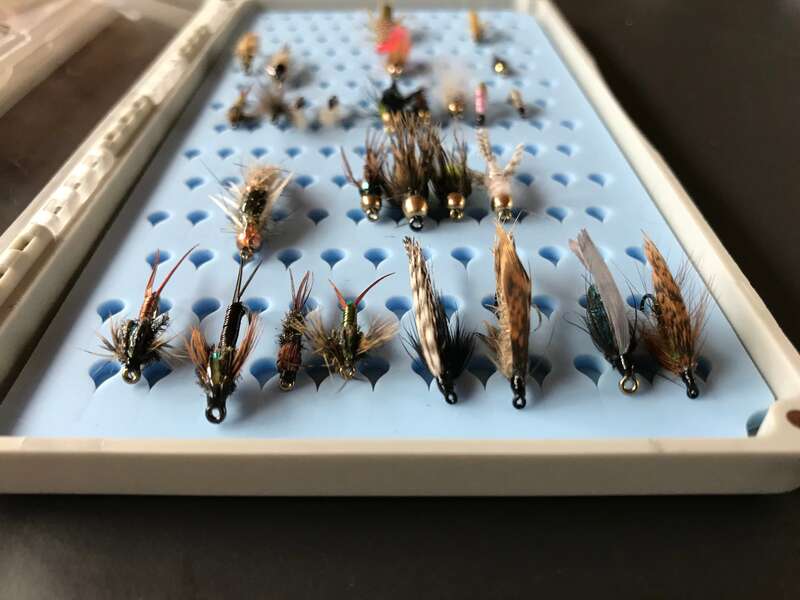 Over the next few paragraphs I want to give you an overview of the fly cases I use, show you for which situation or species I use what type and work out the advantages and disadvantages of different models. I group my fly cases mostly according to three features: size, shape and material. Naturally the smaller the flies, the smaller you can go in terms of size. On some summer days when I fish a small alpine stream, all I bring is a tiny fly box with a few dry fly patterns and a few nymphs. The size of the fly box is similar to a box of matches. 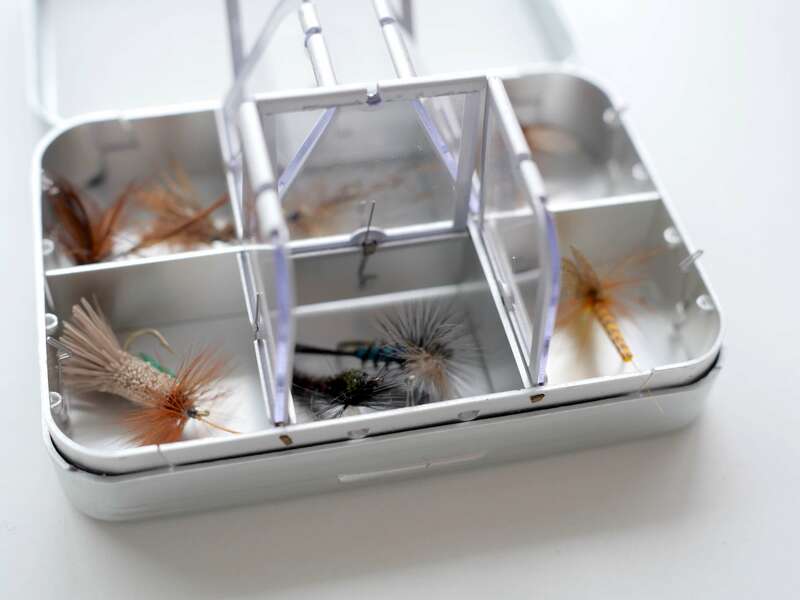 For dry flies and terrestrials I prefer transparent fly boxes with small compartments. This way of storing keeps the flies nice and loose and doesn’t damage delicate wings for example. If the box is transparent it makes it easier to preselect a fly without even opening the box (which can come in handy on windy days). 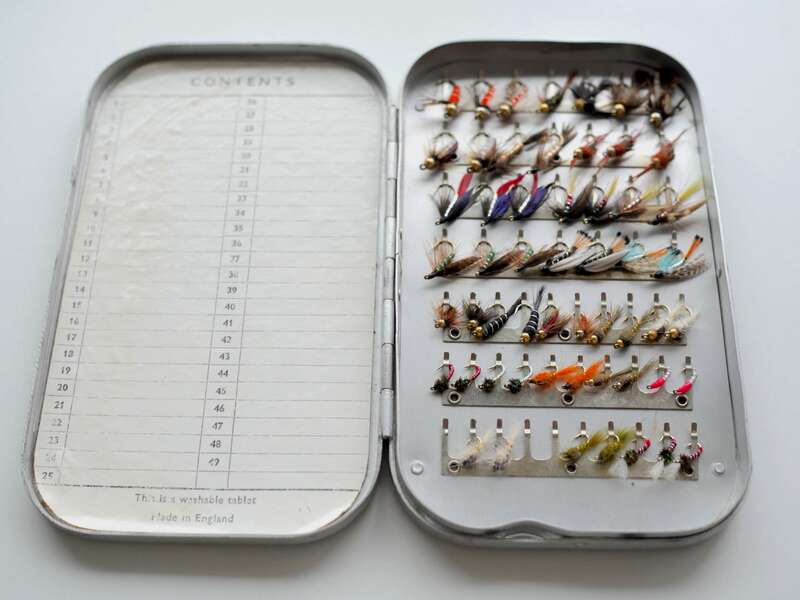 If you are a traditionalist, another great option especially for dry flies are aluminum boxes such as the classic model by Richard Wheatley of England. They have a neat mechanism with mechanical springs that pop open the different compartments. Here again the transparency helps with the preselection of your next pattern. 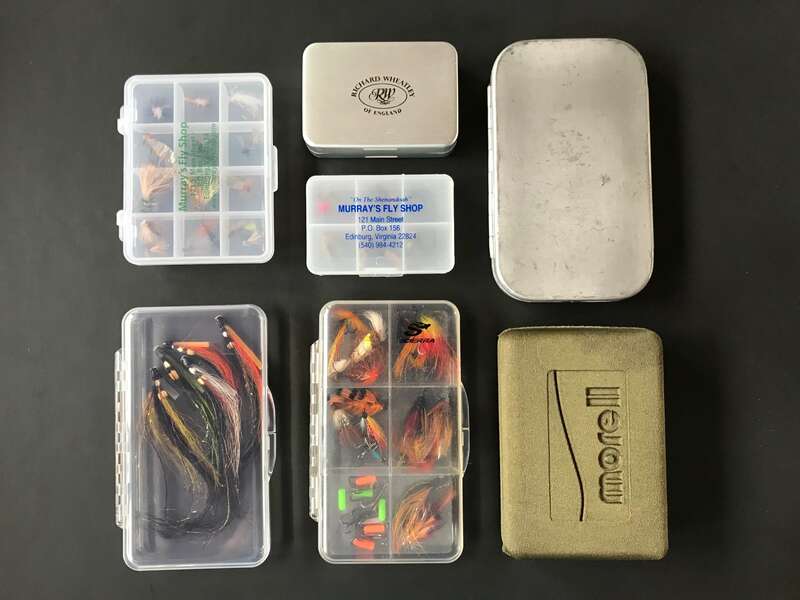 A nice choice to complement the traditional set up is a vintage Richard Wheatley of England fly box that you can get on sites that sell vintage tackle and eBay. They have a very slim silhouette and hold dozens of wet flies and nymphs. Personally I love the vintage feel to it with the scratches and dents telling of former fly fishing adventures. The only disadvantage I see in this type of fly box is the storing system. Although they look neat and tight, the small metal clips don’t always secure the fly 100%. Oftentimes when I take out the fly box after fishing a full day with a lot of wading involved, the flies have slipped or come loose entirely. So be careful when opening the box, especially while standing in the water. A similarly slim box with a more modern touch to it is the Tacky Slit Silicone Insert. 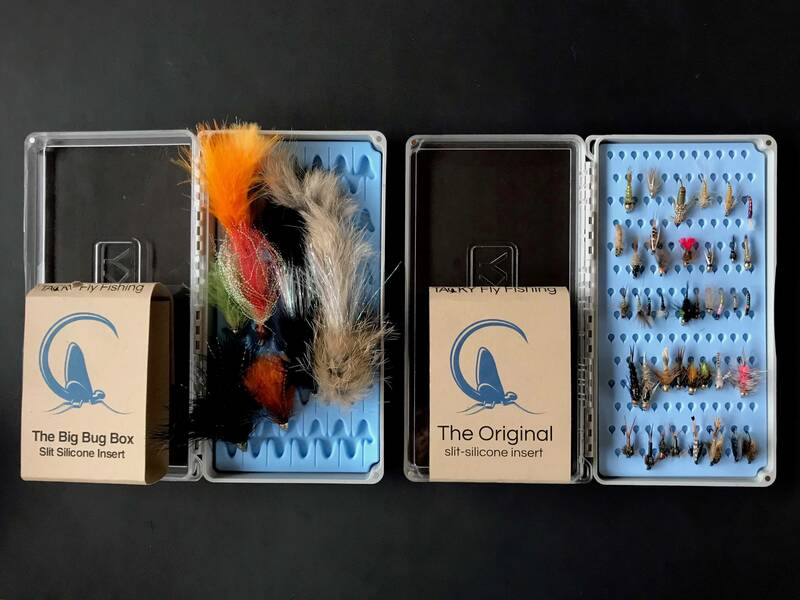 The American made fly boxes have made a name for themselves in recent years and rightly so. Even before opening the box you feel they are well made and will last a long time. The magnetic closure at the corners of the fly cases is a really effective and convenient feature. On top their patented slit silicone feature secures the flies and makes sure they stay where they are. Even after removing flies dozens of times I could not detect any deterioration of the silicone slits. 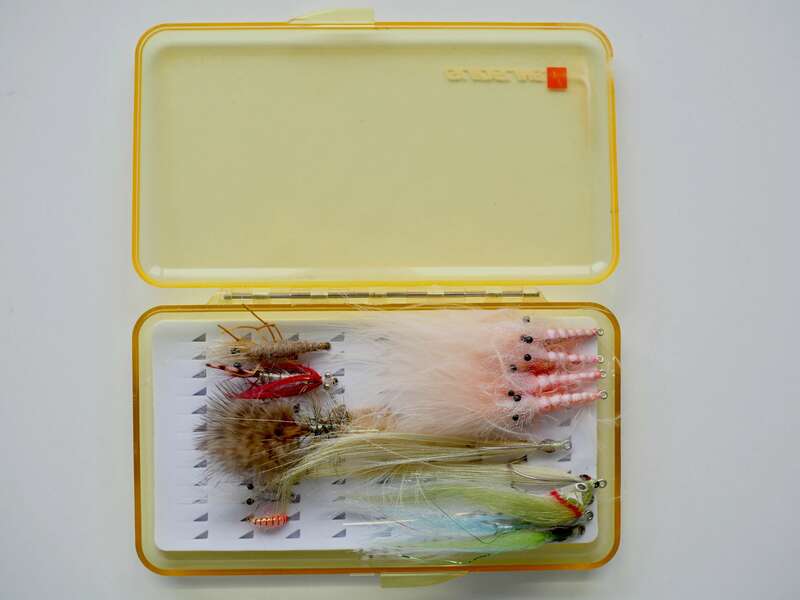 A modern, slim alternative to the Tacky Slit Silicone fly case is the foam fly box from C&F Design. It has a very nice build quality as well and gives you a bit more freedom in terms of organizing your patterns. 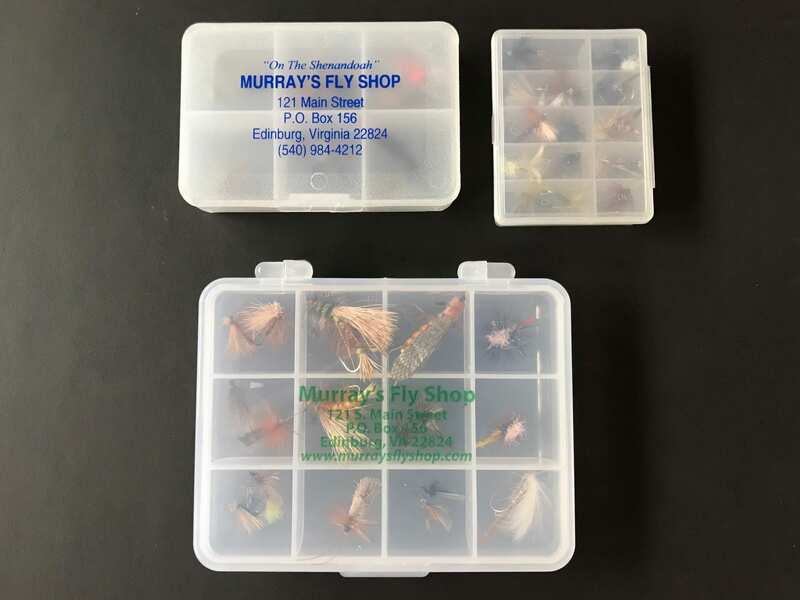 Yet, if I had to choose I would opt for the Tacky Fly Box as their slit silicone system is the most precise and repeatable way of fixing your flies inside the box. 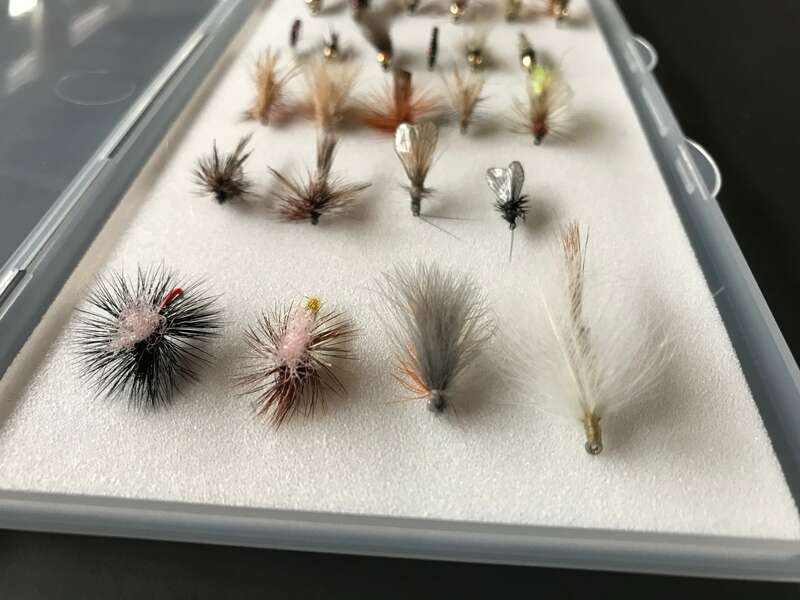 When the flies get larger in size for species such as sea trout, salmon or hucho hucho, I still try to keep the boxes as slim as possible. For seatrout flies I have relied on a simple model by Guideline that has a slit system as well. It allows me to store smaller patterns and bigger streamers as well. For salmon I have relied on similar builds. I mostly use two fly cases. One of them holds smaller salmon flies and also the hooks for the tube flies. In the other one I store large tube flies. The newest addition to my collection of fly boxes is the Tacky Big Bug Box. It features the same slit silicone system as the smaller fly cases I use for wet flies and nymphs. It can hold large streamers of 4 to 5” with its silhouette remaining slim. It is a great choice for streamers to target big predators such as hucho hucho or pike. Isarfliegen for supplying us with high quality flies for the guide. Shop their selection here. World Fly Angler for providing us with the Tacky Fly Boxes. Renato Vitalini lives in the small Swiss mountain town of Scuol. During the day he runs a hotel. In his spare time he builds some of the most colorful custom fly rods.